United Traditional Aikido | "The 'Art of Peace' begins with you." Welcome to the website of United Traditional Aikido. United Traditional Aikido is an association of like minded Aikido clubs based around the UK and it’s principal aim is to promote and support the teaching of traditional style Aikido. With Clubs in Uttoxeter down to Weston super Mare incorporating both adults and children clubs. We seek to encourage a spirit of camaraderie amongst our member clubs through a policy of leaving clubs to concentrate their energies on what really matters; the development of all who practice Aikido. Within the framework of safe and insured practice and that all arts taught are related historically and stylistically to mainstream Aikido. 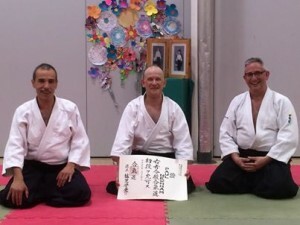 The UTA was founded in 2006 and is a full member of the British Aikido Boar d (BAB) and as such is fully committed to the BAB’s promotion of safe and properly insured practice of Aikido through the BAB’s coaching and insurance schemes. A guiding principle of UTA is to encourage and promote the exchange of knowledge with a wide spectrum of Senior Sensei’s. We have had, and continue to have, close links with, Vince Thompson Sensei 8th Dan & Pierre Citti Sensei 7th Dan, Takimoto Sensei 7th Dan, Robert Mustard Sensei 7th Dan and Larbi El Akel Sensei 6th Dan. Larbi Sensei is the technical director for the UTA and visits every six months for a weekend seminar and gradings. Paul Newnham Sensei being presented with his Aikikai Shodan certificate by Larbi Sensei. As an organisation, we are constantly striving to improve. With an ever increasing membership and dedicated team of Instructors our clubs continue to go from strength to strength. United Traditional Aikido was founded in 2006. The founding club of the UTA was Rising Sun Aikido. Rising Sun Aikido was formed by Sensei Alan Pirie (5th Dan) in Hull in the early 1960’s. After Sensei Pirie passed away in 1996 Sensei Phil Benge took over the running of the club and has remains the senior instructor.